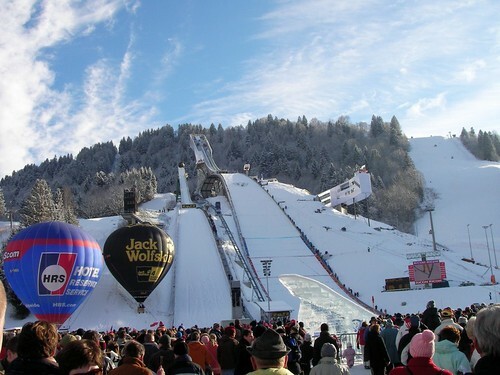 New Year's ski jump at Garmisch, Germany. As a ski destination, Germany is often overshadowed by the big four: France, Austria, Switzerland, and Italy. Most UK skiers are unaware that Germany offers some of the most accessible, attractive, and best value-for-money skiing in Europe. Germany's ski scene combines large resorts likeOberstdorf and Garmisch-Partenkirchen with numerous smaller ski villages dotted across the country. The majority of German resorts are within 1.5 hours of major international airports such as Munich, Innsbruck, Salzburg, Basel, and Zurich. Not only does this mean less travelling, and more time on the slopes, but visitors can also combine skiing with city breaks. For UK skiers driving to the Alps, Germany has some of the closest resorts. Feldberg in the Black Forest is 746 kilometres from Calais (7hrs). This is approximately 2.5 hours' closer than the French resorts of Tignes, Les Arcs, Val d'Isere, and Val Thorens, and approximately 3.5 hours' closer than Austrian resorts of Mayrhofen and Obergurgl. If driving to Germany, you can avoid the hefty French tolls (€70) and there's also no tax disc (vignette) to purchase, unlike in Austria or Switzerland. Germany also offers some of the best value-for-money skiing in the Alps. The larger resorts of Obersdorf and Garmisch are priced at €33-34 for a day's skiing, which is similar to that of Austria and France, but choose a smaller resort like Mittenwald and pay €21 for a day's skiing on 22 kilometres of slopes. For UK skiers driving to the Alps, Germany has some of the closest resorts. Feldberg in the Black Forest is 2.5 hours' closer than French resorts. One of the most noticeable things about Germany is the pretty, traditional resorts. Even the largest, most popular ski resorts, such as Oberstdorf in the Allgäu region, have not suffered from over-development. Simone Zehnpfennig, press officer at Allgäu Tourism says, "The region still has its rural charm - old farmhouses, chimneys, and typical brown cows. We don't have these cold concrete ski resort cities like in the French Alps instead we still have our farmers and their traditions in our ski villages." Oberstdorf (820-2,220m) has 45 kilometres of slopes accessed via 25 modern lifts, including two gondolas. The resort has made a name for itself with cross-country skiers for its 100 kilometres of trails. The local Mount Nebelhorn ski area boasts one of the steepest runs and biggest jumps in the whole country with a maximum vertical of 1,400 metres and a skiable height of 2220 metres. 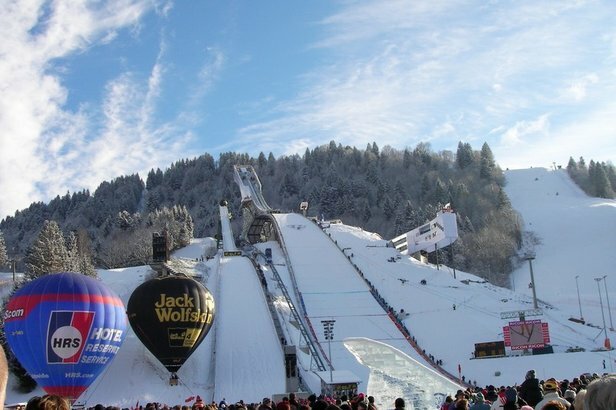 Oberstdorf is perhaps best known as the venue for the 4 Hills Ski Jumping World Cup and the Nebelhorn Classics freeride event. Heading west from Oberstdorf, there are a number of small ski areas and villages like Pfronten, with its 22 kilometres of slopes, 13 gondolas and lifts, deep powder runs, and fun park for snowboarders. Germany also offers some of the best value-for-money skiing in the Alps . . . choose a smaller resort like Mittenwald and pay €21 for a day's skiing on 22 kilometres of slopes. Garmisch-Partenkirchen (700-2,830m), 1.5 hour's drive from Munich, is probably the most popular resort in Germany. Three mountains are well connected offering 62 kilometres of pistes (42 slopes) for all levels. The main ski area is set on the Hausberg, Kreuzeck, and Osterfelder runs. The nearby ski area of Zugspitze has Germany's highest mountain (2,962 m). The town of Garmisch is lined with 100 restaurants, 30 bars, and five discos. There are also plenty of shops to browse and even a casino. The ski-areas of Oberammergau, Lenggries, and Spitzingsee (near Tegernsee) are just one hour's drive south of Munich. The pretty village of Oberammergau (900-1280m) offers nine slopes for all levels: families bring the kids to the special children's ski areas while freeride fans flock to sample some of the deepest powder in Germany. Lenggries (700-1700) has access to 34 kilometres of downhill skiing, well suited to intermediates and experts - it is particularly popular for its challenging World Cup downhill ‘Garland' slope. Spitzingsee/Sudelfeld (480-1850m) has 49 pistes and is a favourite with Munich residents. It is also a popular destination for tourists combining city and ski holidays. If possible avoid this resort at the weekends as it tends to get overcrowded. "We don't have these cold concrete ski resort cities like in the French Alps instead we still have our farmers and their traditions in our ski villages." An hour's drive from Basel is the popular Black Forest ski resort of Feldberg (950-1450m). Its 22 slopes are accessed by 26 lifts, but snow cover can be variable due to the resort's relatively low altitude. Nestled on the Austrian border is the small market town of Mittenwald (945-2250m). Set one hour's drive from Innsbruck, Mittenwald's 22 kilometres of pistes are also just 15 minutes from Seefeld, Austria. Mittenwald can get crowded at busy holiday periods. 20 kilometres from Salzburg, the attractive ski area of Berchtesgaden (600-1800m) offers 50 kilometres of slopes and 38 lifts. 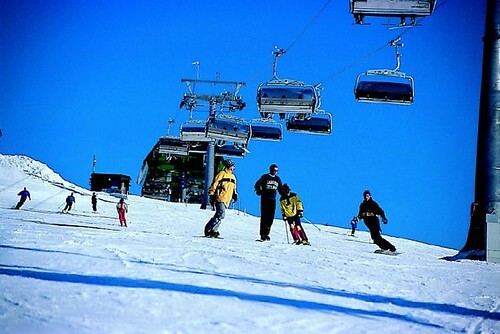 It is made up of six ski centres and boasts pretty tree-lined slopes and modern cable car facilities. The Jenner ski area is the best known and largest of the small areas in the vicinity of Berchtesgaden and is easily reached by car or ski bus. Towards the centre of Germany, is the region of Harz (600-1500m). The mountains aren't particularly high, but the gentle slopes and 27 lifts are suitable for beginners and families. It is made up of the villages of Clausthal-Zellerfeld, Osterode-Lerbach, Altenau, and Braunlage. Downhill skiing isn't the only attraction here; many tourists come to stretch their legs on the 500 kilometres of well prepared cross country trails.